The tonsils are one of the immune system’s first lines of defense against ingested or inhaled foreign pathogens. 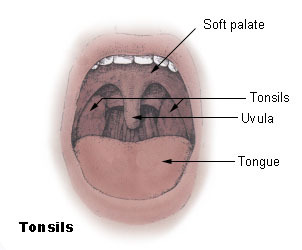 The four sets of tonsils are the adenoids, palatine tonsils, tubal tonsils,and the lingual tonsils. Tonsils consist of epithelial tissue with narrow folds called crypts, secondary lymphoid tissue that contains lymphocytes, and M cells that capture antigens in the respiratory tract. Tonsils tend to reach their largest size near puberty and gradually atrophy thereafter. Tonsils can become enlarged or inflamed and may be surgically removed in tonsillectomy. Chronic inflammation of the tonsils can cause their cells to increase in size ( hypertrophy ). Enlarged tonsils can make breathing more difficult and disrupt mucus drainage in the pharynx. Those with a tonsillectomy show no significant long term difference in immune system function, though minor changes in immune cell and antibody levels do occur. tonsillitis: Inflammation of the tonsils. tonsillectomy: The surgical removal of the tonsils, especially the palatine tonsils. Frequently accompanied by an adenoidectomy. squamous cell carcinoma: a cancer of squamous cell epithelial tissue. tonsils: Paired masses of secondary lymphoid tissue and epithelial tissue found in the pharynx. The tonsils are small masses of secondary lymphoid tissue located in the pharynx. They function similarly to other types of secondary lymphoid organs and also capture antigens from respiratory tract pathogens. There are four pairs of tonsils located within the pharynx. They function similarly but have a few structural differences. The adenoids are located in the wall of nasopharynx. The palatine tonsils are located in the sides of the oropharynx. The tubal tonsils are located in the wall of the nasopharynx near the entrance to each Eustachian tube. The lingual tonsils are located behind the tongue. The tonsils are made of secondary lymphoid tissue and covered with an epithelium characteristic of the part of the body where they are located. For example, the adenoids and tubal tonsils are covered with the ciliated psuedostratified columnar epithelium of the nasopharynx, while the palatine and lingual tonsils are made up of the non-keratinized stratified squamous epithelium of the oropharynx. The tonsils also contain very deep and narrow folds in their tissues called crypts. Like the thymus, the tonsils reach their largest size near puberty and gradually atrophy thereafter. Tonsils: Palatine tonsils can be seen on the left and right sides at the back of the throat. The tonsils primarily facilitate adaptive immune responses in the upper respiratory tract, one of the most common pathways for pathogen entry in the body. In a way, the tonsils are the “first line of defense” against potential respiratory pathogens. They contain specialized M cells that collect antigens produced by respiratory tract pathogens. The secondary lymphoid tissue within the tonsils functions like the same type of the tissue in lymph nodes. Captured antigens are presented to B and T cells within the tonsil, then the B cells migrate to germinal centers within the tonsil as an adaptive immune response is initiated. Additionally, evidence exists that suggests that tonsils may play a role in T cell maturation and development like the thymus does, but more research is needed. Tonsil removal (tonsillectomy) is a common procedure to treat swollen and infected lymph nodes (tonsillitis). It does not appear to cause weakened immune function. Chronic infection of the adenoids can cause adenoid hypertrophy, increases in cell size from repeated damage. Enlarged tonsils can make it more difficult to breath and disrupt normal mucus drainage in the pharynx, so removal is generally recommended in those cases. Squamous cell carcinomas (epithelial tumor) and lymphomas (lymphocyte tumor) can also develop in the tonsillar tissue, and removal is a key treatment. Epidemiological studies show no significant change in immune system function in those that have a tonsillectomy, but minor increases in helper T cell levels and minor decreases in IgA levels (an antibody produced by B cells) were observed.